As many readers probably know, I was once an atheist but was “argued into the Kingdom.” Because of this, I tend to collect stories of other atheists who have become Christians. What intrigues me about these stories is that few of them are alike. God seems to use many different means to call people to Him, which is both wonderful and fascinating. Every now and again, however, I find a story that is similar to mine. Recently, I learned about Dr. Patrick Briney, and while there are some differences between his journey and mine, there are some similarities as well. …led to Bible studies, discovering answers, and eventually my salvation about two years later. In this version of his story, he is short on the details, but according to another article he wrote, creation science played a role in this process. As I read that article, I couldn’t help but notice the similarities (and differences) between his story and mine. He was an atheist when he went to university. That’s slightly different from me, as I was an atheist until my late high school years but was a young Christian when I went to university. However, it seems that the design found in nature was an important part of his realization that atheism isn’t a scientifically reasonable position. That’s also what first drove me away from atheism. To this day, I find it hard to understand anyone who has studied the natural sciences to any great extent and is still an atheist. As I scientist, I think the data point unmistakably to a Creator. There is at least one important difference in our stories. Even as a high school student, I recognized that evolution was a terrible theory for biological origins. Thus, while I was an atheist, I was not an evolutionist. I simply thought that science had not yet come up with a robust theory of origins. It seems Briney was a committed evolutionist, and the evidence against evolution was another important factor in his journey away from atheism. He became a Christian at university, and then decided to go on and get a Ph.D. in microbiology. This leads to another difference between our stories. I went to graduate school and studied nuclear chemistry with the plan of becoming a university professor, while he went to graduate school with the plan of being a campus minister. He thought that by pursuing and earning a Ph.D., he would not only be more integrated into the academic community, but he would also be better able to minister to those who were experiencing the university environment. This brings us to another similarity between Dr. Briney and myself. Even though I planned to be a university professor and did so on a full-time basis for a while (and still do so on a part-time basis), I also ended up in an academic ministry. While Dr. Briney focuses on university students, I focus on homeschooled students, many of whom will attend university. Nevertheless, we are both trying to show students how studying science is really studying the Creator’s works. Many great scientists of the past understood this, and some great scientists of the present understand it. Dr. Briney and I share the goal of helping future scientists to understand it. That’s probably the most important similarity in our stories! While AiG promoted the movie, they have not reviewed it, despite the fact that two of their scientists are in it. They added an explanation, stating a reader had pointed out the great unconformity does indeed appear on other continents (but is still not evidence of a global flood). It’s like he used evolutionist thinking against them. How do you get from deism to Christanity? A religious experience? For me, it was an intellectual experience. Once I decided science points unmistakably to a Creator, I wanted to learn who this Creator is. So I read the Koran, the Bhagavad Gita, some Taoist works, and the Bible. The Bible stood out as the one with accurate science, accurate history, and the ability to predict the future. These things made it clear to me that the Bible was the Word of the Creator. Thanks for that – so you’re not the William Lane Craig variety of Christian. His apologetics definitely imply an innate knowledge of a personal god as an underpinning for faith. My 40 year career has been spent in the oil and gas exploration industry. Not to appear close minded or anything but everything I have seen of the data, and I’ve seen lots of it, makes the notion of a young earth completely ridiculous. Also, the notion that this vast universe of billions of stars was created specifically for the ultimate creation of man seems to be an enormous conceit on our part. I find the whole religious community to be a morass of conflicting theology, personal attacks and accusations of heresy. I believe you have experienced that yourself. I can’t see anything but a profound religious experience make me consider a belief in a personal god. I’m surprised you would come to it intellectually especially by choosing some particular set of writings. You are welcome. I hate to appear closed-minded as well, but anyone who says that the notion of a young earth is completely ridiculous hasn’t looked at much data. From a scientific point of view, there are aspects of the earth that make the idea that it is ancient look ridiculous. There are also aspects of the earth that make the idea that it is young look ridiculous. In the end, any honest scientist must make a decision based on looking at both sets of data. In my mind, the preponderance of the data indicate that the earth is thousands of years old. I don’t know of any Christian who thinks the universe was made for us. The universe was made by God for Himself. It makes perfect sense that it is vast, since God is infinite. Likewise, your evaluation of the “religious community” is completely foreign to me. There is no other community of which I am aware that could care for me and my family more deeply than my church family and extended Christian family. Sure, we have our squabbles, just as all families have their squabbles, but like any real family, our love for one another rises above our squabbles. Like many families, there are also some “black sheep” in the Christian family. But they are, by far, the exception, not the rule. I have read some of William Lane Craig’s works, but I am not sure what you mean by, “His apologetics definitely imply an innate knowledge of a personal god as an underpinning for faith.” Certainly, once you come to know the Savior, you can achieve a deep, personal relationship with Him. I have. However, I had to come to the Savior through my intellect, since it was my only guide up to that point. I would think that Craig also tries to convince people about the Savior on an intellectual level. At least everything I have read from him suggests that. Interesting. Thanks for your feedback. I’m afraid I’ve seen way too much data, and used the old earth paradigm far too successfully for too long to accept a young earth. Cognitive dissonance would make my head explode. It seems to me the young earth paradigm is there mostly to support creation vs evolution. I’m certainly not knowledgeable enough to take on that topic but I would suggest there might a whole lot of stuff we don’t know that could lead to an entirely different hypothesis. So do you think in this vast universe God has created other versions of us? Why not I guess. Craig does indeed argue that all mankind knows god. He does argue for deism intellectually. That’s the easy bit. The personal god is way tougher and seems to require an experience of some sort. Too big a leap for me I’m afraid. I guess that’s why I engaged you here – not too may scientists are willing to elaborate on their conversion experience. Anyway I do find these conversions to Christianity fascinating, There’s certainly no shortage of personal accounts of conversions going the other way. They are usually a lot more explicit. I find what you wrote about cognitive dissonance to be interesting, Kathy, since that’s exactly my thoughts on believing in an old earth. Before I started my graduate work in nuclear chemistry, I believed in an old earth. However, as I learned more, the cognitive dissonance continued to grow, and as a result, I am a young-earth creationist. That’s the only way I can make sense of all the science I have learned. You are certainly incorrect about the young-earth paradigm being there to support the creation vs. evolution debate. Scientists believed in a young earth long before the creation vs. evolution debate. In addition, there are many creationists (typically called “old-earth creationists”) who strongly oppose evolution but can avoid the cognitive dissonance of believing in an old earth. 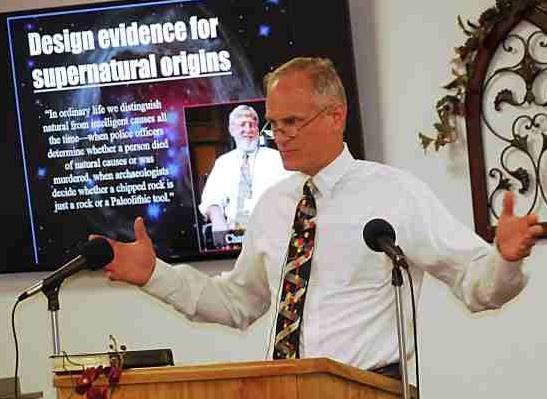 Indeed, William Lane Craig is an old-earth creationist. I can’t speak for all young-earthers, but I am a young-earth creationist because the data speak so strongly in support of it, and the young-earth creationist paradigm has been so incredibly successful in its predictions about the data. I really don’t know if there are other versions of us in the universe. Once again, I am driven by the data. So far, all the data say no, but then again, the size of the sample that we have been able to analyze is not statistically significant. Thus, I really don’t have an opinion either way. Perhaps you have read more Craig than I have, but based on what I have read, he also argues for Jesus on a very intellectual level. In this article, he gives intellectual reasons for believing that Jesus rose from the dead. In this one he uses history to argue for Biblical veracity. In this one, he uses archaeology to argue for the veracity of the Bible. I don’t recall any article in which he argues in a way that doesn’t appeal to the intellect. I continue to wonder where you get your experiences about Christianity. I can’t think of a Christian (scientist or not) who isn’t thrilled to share their conversion story, in detail. I guess my experience has led me in an entirely different direction and I’m pretty convinced the earth sure ain’t young. Anyway appreciate the time you’ve taken to chat with me. You would be interested to know that I completely agree with you on the AGW debate. The science is young, the climate is complex, returning to a pre-industrial age I would certainly consider catastrophic for the human race, the very, very uncertain threat of run away global warming is remote. Models really aren’t very good at predictions.